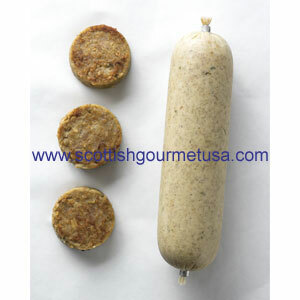 Home/Meats & Meat Pies/Back Bacon - Scottish Style - 1 lb. In Scotland, they serve bacon rolls for breakfast. The rolls are soft and fresh, the butter is sweet without salt, and the bacon is 'proper bacon.' The lean cut of bacon comes from the loin or back - not the belly. We now have our own brand of Scottish style bacon, made in small batches exactly the way you want it. 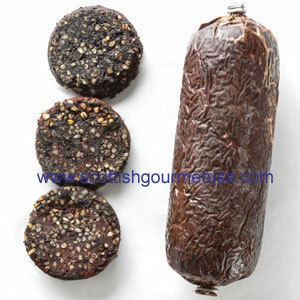 Packed in one pound vacuum packs, each holding 8-9 thick slices. Grill it, fry it in a non-stick pan, turning once. Perfect for eggs benedict, lovely rolled and baked with a chicken breast, and perfect on a soft breakfast roll all by itself. Far less fat than regular belly bacon, so clean-up is easy and the taste fantastic! Sliced Pork Loin cured with up to 13% solution of Water,(Cured with Water, Salt, Brown Sugar, Sodium Nitrate). Keep refrigerated or frozen, cook thoroughly. Pork is a Product of Canada. I am British and moved to America 6 years ago for work. Whilst being able to source many foods from home locally, British style bacon was one of the things I really missed. I was a little apprehensive ordering the bacon due to not knowing whether the cure used would be authentic to the type of bacon we can buy in the UK. I should not have worried. Both the cut and cure were spot on and frying a few rashers and making a bacon sandwich with a white flour bun tasted just like it should! A truly authentic product, thank you and very well done. Just like in Scotland. Love it. Have it on a role with real butter. hands down better that streaky (US style) bacon. Owner Response: Thanks, Michael - we also love Bacon Rolls! I love it. I can only get bacon like this in the UK and Ireland. Thank you so much for carrying it. What a treat! Excellent back bacon - the only way to have a bacon sandwich or a 'roll n' bacon'. Just as if Inhad bought it in Scotland. Tasty! We had a Scottish breakfast for New Year... Cullen Skink, eggs, haggis, tomatoes, shrooms, toast, and this bacon!!! Delicious stuff, lean, moist, cooked up yummy! First time I have found real bacon in the USA. Perfect. The USA belly cut style bacon is too fatty for my liking. The back bacon from Scottish Gourmet is just like you get in Scotland. Tasty and only a fraction of the fat. This makes US bacon blush with shame! Reminds me of the gammon rashes I used to get in UK and Europe. This is the best British style bacon that you can buy in the US. It is not over salted with curing salt, the fat is minimal but enough to provide the flavor profile and it makes the best bacon sandwich if you add a little brown (HP) sauce. If you love british bacon, this is the one to order. Flavorful with little fat, it is great for breakfast with eggs or beans. We can't find this quality anywhere else so it is on our repeat order list. I was very satisfied with your back bacon product. Finding back bacon where I live is impossible. I was so happy to find your website! Perfectly Packaged - Superior Product! Love Love my first shipment of bacon and sausages! I only placed a small order initially to try it out as I was concerned if the items would reach me in good condition here in Vegas especially with the heat, but I needn't of worried everything arrived beautiful packed and still super cold!! Eating a lovely delicious bacon breakfast this morning! P.s these rashers are superior quality cut on the thicker side and cook up with very little shrinkage.. Just perfect! I ordered back bacon because my visiting friend from Scotland kept talking about it. She was most impressed and pleased. So am I.
I don't eat bacon often, but when I do I now prefer this Back Bacon Scottish Style - wonderful with eggs, pancakes, waffles, apple sauce and so much more. Easy to cook - we buy extra and divide it into smaller amounts, then freeze for use at a later date. Reminds me of my wonderful visit to Scotland. I have been trying to find this ever since! It's delicious! Now that I have found the source I will keep ordering. My husband and I love it! Thank you! Amazing! A lot leaner than I expected. It was a huge hit! My husband loves this bacon, haven't been able to find it previously, thank you for stocking it! This bacon is wonderful. Don't cook it to a crisp. Meat not fat....yum!!!! This bacon is great. It is just like the bacon I've had in London and around England. I actually had some friends visiting from London when my order arrived and they agreed that it was just like they would have at home. I would purchase this all the time if it were not so expensive. I thought I'd never again taste real Scottish style bacon. This isn't the overpriced slabs of fat which passes for bacon in the US. (which we call streaky bacon in the UK). This product is excellent. Definitely 5 stars. Great taste, I wish there bacon without the sodium nitrates. I would give it 5 starts if you had a nitrate free brand. Owner Response: I wish I could offer a nitrate free brand too! Cured pork sold into interstate commerce must have a preservative, according to the USDA! And since we ship all over America, we have to have some preservative. I hate that white stuff bubbling out when you cook it, but that is what we are required to have. Perhaps we can find a smoked back bacon as that would not require the nitrates. We love back bacon but find it hard to find. After using several sites to order it, this bacon is the best that we have found. Delivered quickly and cooks up well. Yummy breakfast servings. Ordered Bangers, Bacon, Black and White Pudding! Loved all of it. Remided me of my time overseas! Really tasty and moist bacon - just broiled in my toaster oven. Just like the UK! It brought back memories of the Breakfasts we had in Edinburgh, Mull, Fort William, Loch Ness, Etc. This is the best. Quick delivery. Arrived in perfect condition. Tastes wonderful. My wife and I will never eat regular bacon again after having the Rashers. Flavor is "off the chart" great!!! Try Microwaving the bacon on low (experiment) between paper towels for a minute or two (again experiment). The nitrates should leak out to the paper towels without cooking the bacon Again, experiment - no two microwaves are equal). I have been pleased with my results.. Nice crispy fried back bacon. Good Luck and enjoy the grat Scottish bacon. I had about given up on being able to find authentic Scottish bacon. I have paid dearly for it in the past only to be disappointed. This bacon , however, tastes exactly like home..just as if my old nanny had cooked it and sat it down in front of me. It is tasty and authentic. I am so happy to have found the Scottish Gourmet. I hope they never stop offering this wonderful bacon. For 20 years now, we have visited the United Kingdom. Each time, we can't seem to get enough of the good back bacon served at breakfast. I've tried a few other retailers in the US but none have duplicated the famous taste...until now. You have nailed it: the best back bacon this side of the British Isles. Thanks for sharing. My husband and I have both lived overseas and this bacon matches the best that you can find anywhere. Just perfect. Sometimes only a proper British fried breakfast will do, but what about proper back bacon? Well, you can find it here! Best bacon you will get in America. American bacon just has so much fat in it, after eating the British cut you won't eat anything else. Worth the extra cost. Love this bacon. Reminds me of breakfast in Scotland. Makes a great nutty sandwich.